Local food production, especially with fruits and vegetables is growing tremendously. In addition to helping your local economy, you can feel good knowing that your locally sourced foods are providing you and your family with healthful benefits. You may have heard people referring to themselves as locavores. You may even be considering joining the locavore movement yourself. Locavores are people who eat only locally-grown produce and, when possible, rely on meat, eggs, and other food products from local sources. 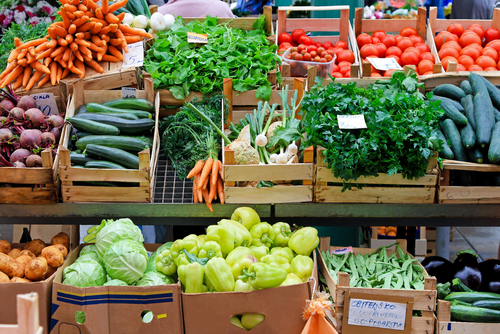 Recent studies demonstrate that consuming locally-sourced foods has positive health benefits. One of them, published in the Journal of Rural Health in 2011, showed that across all counties in the United States, people who live in areas where locally-sourced food is readily available tend to have lower overall rates of obesity, diabetes, and mortality. Furthermore, in a paper published in Economics and Human Biology in 2012, Dr. Matthew J. Salois estimated that for every $100 increase in spending per capita on locally-sourced fruits and vegetables, you can expect to see a decrease of 1.1 percent of the area's obesity rate and a decrease of 1.3 percent in the area's diabetes rate. While the foods themselves may not necessarily have a higher health value, you are likely to realize more nutritional gain because you will be eating them closer to their time of harvest. When we harvest, package, and ship foods around the country, days or even weeks can pass before they appear on your grocery store's shelves. This delay between time of harvest and time of consumption results in a decline in the food's nutritional quality, as was demonstrated by Professor Gareth Edward-Jones in a 2010 study published in the Proceedings of the Nutrition Society. As an added benefit, your fresh, locally grown produce is likely to taste much better. Many fruits and vegetables in your local grocery store traveled a long way to get there. This is particularly true for out-of-season fruits and vegetables. To ensure that produce remains "fresh" until it gets to your table, food producers treat produce with a coating of chemical preservatives. Though the FDA believes these preservatives are safe, any time you can avoid ingesting unnatural chemicals with your food, you absolutely should. Only unprocessed, organic fruits and vegetables will be preservative-free. Because they have a shorter shelf life, they need to be consumed soon after harvesting. For this reason, it is likely that any organic produce you find in your grocery store is locally grown. Also, if you attend a farmers' market or go directly to an area farm, you can ask the person who grew the produce whether it has been treated with preservatives or other chemicals. When you rely solely on local growers for your produce, you will be able to purchase only seasonal fruits and vegetables. This means that your menu will vary throughout the year. As produce comes into season, you can try different recipes that will enable you to use them. A diversity of diet has positive health benefits for you. This is because of the different phytochemicals found in various fruits and vegetables. By diversifying your consumption, you can be sure to fuel your body with a variety of antioxidants and healthful phytochemicals for maximum nutritional benefit. Diversity is particularly important for those on restrictive diets, such as vegetarians and people with gluten intolerance. If you are fortunate enough to have access to a community garden, I strongly recommend that you participate. In a study published in the Journal of Nutrition Education and Behavior, Dr. Katherine Alaimo revealed that households in which one or more family members participated in a community garden were 3.5 times more likely to consume at least five servings of fruits and vegetables each day. Another study, published by Dr. Jill Litt of the Colorado School of Public Health, had similar findings. Dr. Litt's study showed that more than 50 percent of community gardeners meet the national recommended daily consumption of fruits and vegetables, while only 25 percent of non-gardeners could say the same. Additionally, community gardeners rated higher in physical and mental health than non-gardeners and achieved more emotional and spiritual balance.